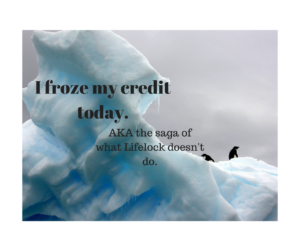 I froze my credit. How about you?? Brrrr, it’s cold in here. I just finished freezing my credit, how about you?? I’ve learned a bit about my credit, and what I can do to protect it, over the past couple of weeks. What seemed like a non event to me, turned into a bit of a journey. Click on the video to learn more, and check out the links below for resources aplenty to help you figure out what’s the best route for you to take to protect your identity from the cyber crooks out there. If you’d like to read up some more about all of this, here are a couple of articles which I found helpful. One is by Michelle Singletary from the Washington Post. The other is from Consumer Reports. Are you one of the 140,000,000 who may have been caught up in this mess? Did you learn anything about how to protect your credit, or other private information, from cyber thieves? Hit reply and tell me. I’d love to hear from you.